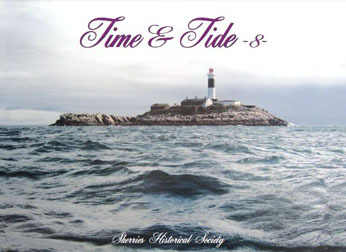 Time & Tide, Volume 8 contains nine local history papers which were presented at the Skerries Historical Society monthly meetings between 1978 and 2011. They deal with aspects of daily life including business, transport, education, voluntary work, sport, leisure and public health. The authors write with a deep knowledge of Skerries and have made good use of their source material. The essays are valuable gifts from the writers which will give readers an increased understanding of the traditions of resourcefulness, co-operation and willingness to accept new ideas which were (and are) characteristic of the inhabitants of Skerries. Volume 8 – please choose your shipping destination. Skerries Bookshop, 77 Strand St.
Greg Reddin (Infosystems), 66 Strand St.
Alternatively, email librarian@oldskerries.ie and have the book(s) mailed to you (postage payable).